I'm sure you have had one of those days where you wake up late, you forget things at home and then you get to where you need to be and feel completely flustered...right? I've had that this week and the feeling leaves me deflated. It doesn't set a great start to the rest of the day BUT the bright side is the fact that tomorrow is Friday and the LONG weekend is closer. To be honest, I completely forgot about the Memorial Day holiday on Monday but having a day off is a very welcome feeling! As a result of feelin' like a hot mess, my outfit was simple with messy hair and missing arm candy (which left me feeling a bit naked...). C'est la vie! LOVE this outfit. 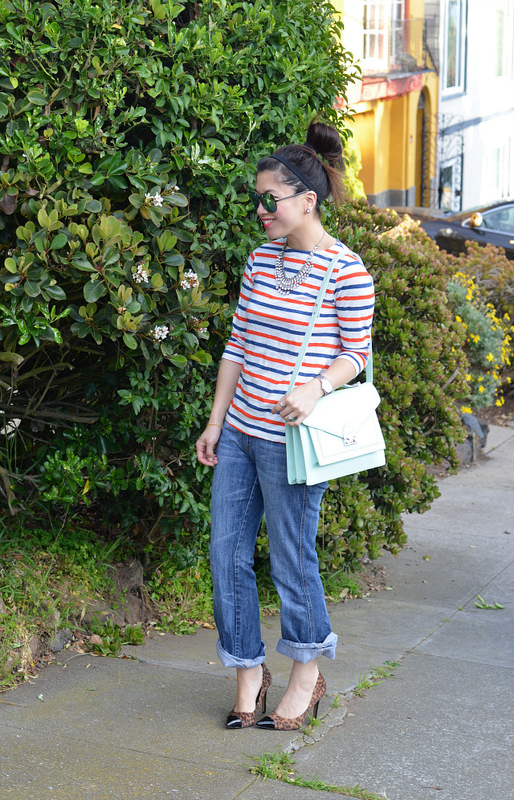 I'm a huge fan of stripes. Loving this casual outfit...super chic! that's a great memorial day look!! great look!! love the jeans! I totally know the feeling! This week has been crazy and I can't wait for the long weekend. For being 'a mess' you look stinking adorable! And I know how you feel about not having arm candy...I just feel a bit lost! the colors are perfect! love your style! I totally know that feeling! Although I've had a three day week at work, I don't know where to put my head! 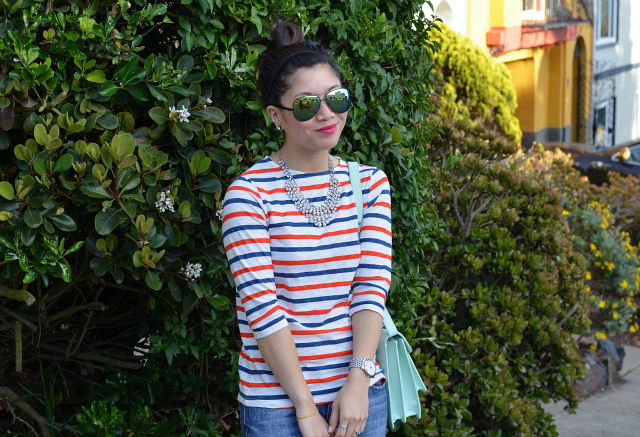 Love your colorful striped tee! So enjoy your long weekend and have a break, dear! 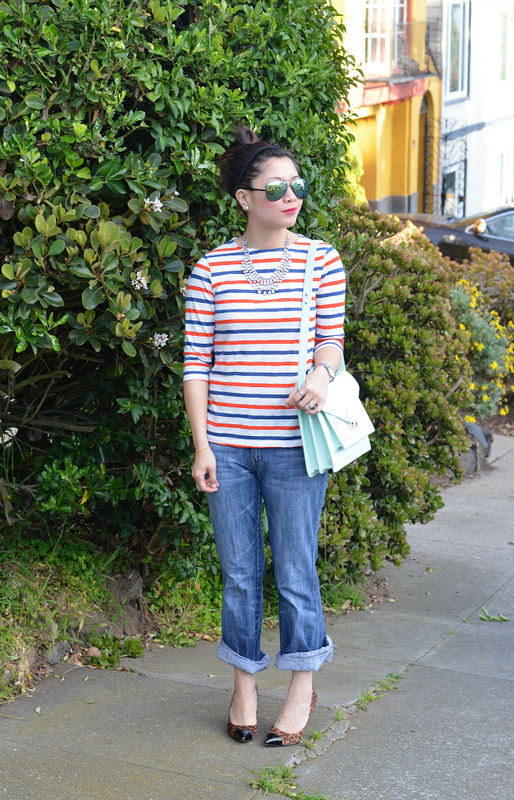 however, I like the summerly colors of your sweater and the bag is cute too! Cute! I love your bag! 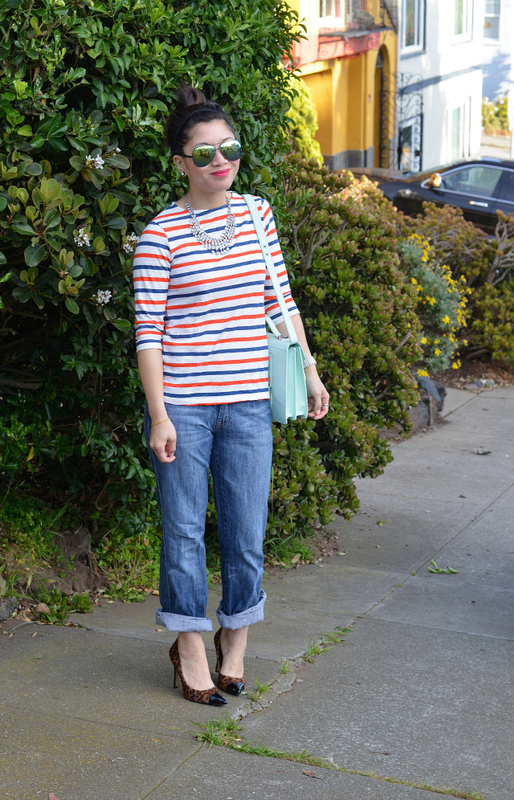 love your stripes - and yes, definitely ready for the long weekend! Your blah day sure looks great! You always looks so chic! Even when you're flustered, you look fantastic. 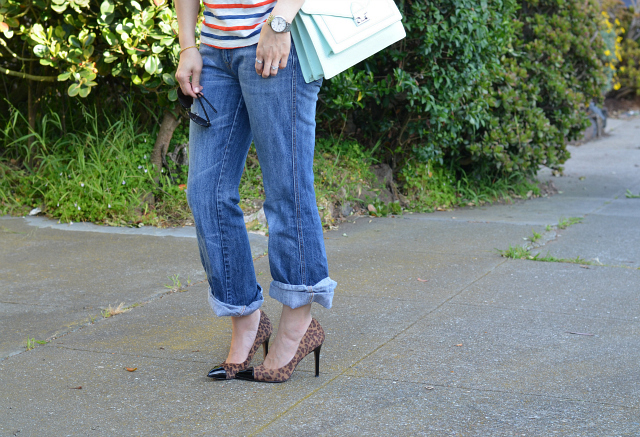 I like the cuffed jeans and heels! Great reflected sunnies too.